It is important to recognize that the need to move over to a phenotypic view of evolution is not just about incorporating continuous inheritance into the transition equation. Even restricting ourselves to particulate inheritance and nuclear genetics the phenotypic approach gives insights that are simply missed using a genic approach. In this post I talk about one of the more entertaining lines of research, mutation accumulation experiments, and how the color and the direction of the research might change using a phenotypic approach. From a phenotypic perspective what we care about when studying mutations is how they affect the phenotype. Thus, as pointed out last week, we honestly don’t care about the details, rather we care about how mutations change phenotypes and most importantly how they change the transition equation in general, and the additive genetic variance in particular. The way we have addressed this thus far is with mutation accumulation experiments. In a typical mutation accumulation experiment a single inbred and highly homozygous line is replicated. Each of the replicated lines is maintained at a very small population size (usually brother sister mating, or in plants, selfing). These lines are maintained for many generations. During that time mutations accumulate, and the lines generally decline in fitness, and the variance among lines increases. These data are used in two ways. The less interesting, from our perspective, is that there is usually a decline in fitness demonstrating that most mutations are at least mildly deleterious. The other, which I want to focus on, is that the variation among lines is used to estimate the mutation variance Vm, the variance introduced into a population each generation as a result of mutation. This in turn can be used to estimate mutational heritability, , where Ve is the environmental variance. Here in lies the problem: It is tempting to equate Vm with the change in additive genetic variance. To their credit Halligan and Keightly do not suggest that Vm is a measure of the increase in additive genetic variance, so this is actually not a criticism of the research, but rather the tempting interpretation of the research. To see what is wrong with the additive interpretation of MA experiments, it is first necessary to recognize that variance components, and indeed, the “effect” of an allele is always a property of the population in which it is measured. 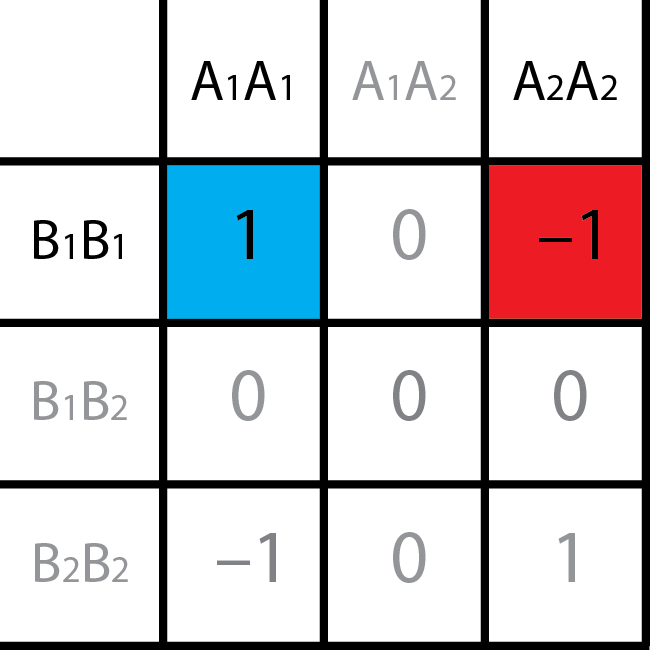 In a typical MA experiment new mutations will always occur in a homozygous background, thus, and interaction effect is always expressed as a main effect of the allele in this simplified genetic background. To see this, consider the AXA genetic system I have introduced on several occasions. Imagine a set of MA lines is fixed for the AABB genotype, and a mutation occurs converting A to a. In this case the mutant population becomes aaBB, and the phenotype is converted from +1 to -1. Notice that in this situation we only see the A1/A2 allele difference as an additive effect. 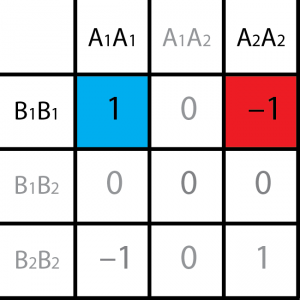 Since the B2 allele is not present in this experiment we will never see that the A and B locus epistatically interact. Even if we cross it back to the ancestral population the best we will get is a measure of dominance (in this example there is no dominance). The point is that mutations occur in the context of a genetic background. When they occur in typical natural population they are occurring in a variable and, due to sexual reproduction, changing genetic background. This is very different from the simple homozygous genetic backgrounds of MA experiments. As they are currently executed MA experiments tell us that mutations occur, but unfortunately, they tell us little about how these mutations affect the response to selection, or what they do to the phenotype in any particular population. One of the nice things about the Halligan and Keightly review is that they suggest future directions for research. This is where the genic view and the phenotypic view really part company. The suggestions they give all involve using whole genome sequencing to get a better handle on mutation rates, the distribution of genetic effects, and their effect on gene expression. From a phenotypic perspective I would think that a better use of research energy would be to try to estimate the extent to which mutational effects are additive versus epistatic and dominant, and more importantly find a way to estimate the rate at which mutations increase the phenotypic variance and additive genetic variance in a population. Non-additive effects could be qualitatively measured by examining the variance in local breeding values in the MA lines either by doing a diallel cross among the MA lines, or preferably by crossing the MA lines to a several outbred strains (see De Brito, Pletscher and Cheverud 2005. Evolution 59: 2333-2342 for an example of this experimental design using RI lines). If the variance in local breeding values was high this would suggest that a mutations effect was largely non-additive, and that mutations were causing population divergence along the lines suggested in the Dobzhansky-Muller model of speciation. As far as the input of mutations to the additive genetic variance within populations, this could probably be best done using a carefully chosen wild population. In particular, I would look for a closed (no immigration) natural population with a known long term effective population size that can be bred in the laboratory, something along the lines of the desert pup fish, or a cave arthropod. I would use this population to measure the additive genetic variance (and phenotypic variance), and using the infinite alleles model of mutation ( ) I would estimate the mutation rate that would give me the observed additive genetic variance (the Va should be zero in the absence of mutations). By solving for the additive mutation rate you are really solving for the “effective additive mutation rate”. That is the mutations themselves may be highly dominant or epistatic; however this calculation would lump both the additive effects and the converted epistatic effects into a net contribution to the additive genetic variance for mutations, and after all, that is what we really want. This entry was posted on Thursday, August 22nd, 2013 at 8:53 am and is filed under Uncategorized. You can follow any responses to this entry through the RSS 2.0 feed. You can leave a response, or trackback from your own site.